Colin Currie appeared as soloist with the Cincinnati Symphony Orchestra earlier this month, performing a percussion concerto that Finnish composer Kalevi Aho wrote specifically for him. It just so happens that the same weekend Currie was here in town, his new album was released on his own record label, Colin Currie Records. 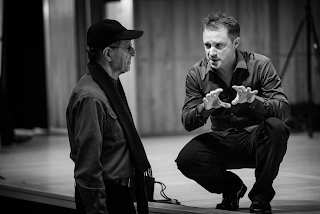 This album was done in collaboration with composer Steve Reich. While he was here, we asked him to drop by our studios and tell us a little more about how this album came about. He went on to explain how he first met Steve Reich. Many of the pieces he performs require both physical and mental stamina. He told me how he prepares for these types of performances. Of course, I always enjoy hearing about what first drew these great artists towards their instrument. Whether you were able to see Colin Currie perform at Music Hall or not, I highly recommend checking out this album. There is a reason why he’s considered one of today’s leading percussionists. April 18th marks the 200th birthday of Austrian composer and conductor Franz von Suppé. We’re celebrating this week with an all-Suppé playlist! Not too familiar with Suppé? That’s okay! Give his music a listen and let us know your favorite! Ever wonder what the radio personalities you listen to on WGUC each day do when they are not in the radio studio? Or how did they first came to work in classical radio? Learn more about your friends at 90.9 as we “Meet the Host” here in Clef Notes! This month we feature an interview Brian O’Donnell did with Elaine Diehl back in 2017.